Pages from my personal notebook, with notes for tonight’s program, and the New Moon chart. Tonight’s Planet Waves FM takes a placid look at our edgy moment. To everyone’s great relief, I omit the news entirely, and focus on the astrology: Monday’s Aquarius New Moon, the Imbolc cross-quarter (and beginning of the Year of the Pig), and the unusual conditions of Venus and Mars. To wit, Venus is conjunct Ixion and Pholus, and is square Chiron and Salacia, while Mars is now square Pluto and conjunct Eris. That is a lot of contact between the inner planets and the outer, which describes some unusual opportunities in our current moment. Selection from the Special Counsel’s grand jury indictment of Roger Stone for witness intimidation and several other counts. 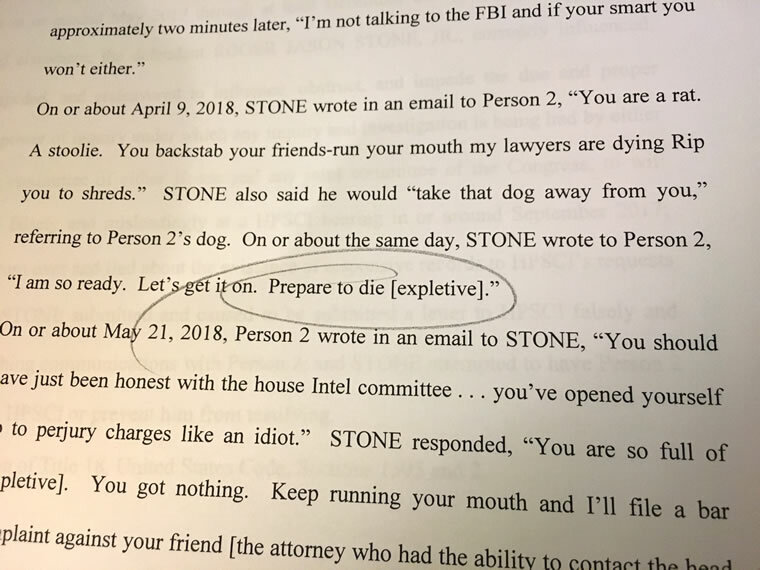 In this passage, he is threatening to kill radio host Randy Credico — and to take his dog. I believe that this statement led to the use of a paramilitary squad to arrest him, unlike any of the other raids or arrests so far resulting from investigations by the Special Counsel. In tonight’s Planet Waves FM, I look at the chart for the arrest of Roger Stone, one of the most notorious dirty tricksters in the history of American politics. The Special Counsel has charged that he was responsible for orchestrating the connection between WikiLeaks and the Trump campaign in 2016. This was the source of the stolen Podesta emails that damaged the campaign of Hillary Clinton.